One thing that on a personal level I'm especially partial to is antique film cameras. For me, the attraction has much to do with the antique lenses, these historical alignments of glass, more than anything else. But since in the majority of situations it's either impossible or just completely impractical to make antique lenses work on digital bodies, sometimes I compromise and shoot a roll or two of film. Afterall, film can still be fun. And that's part of what led me to the Canon IVsb, the most interesting 1950s copy of the Leica IIIc from Japan that I've seen. 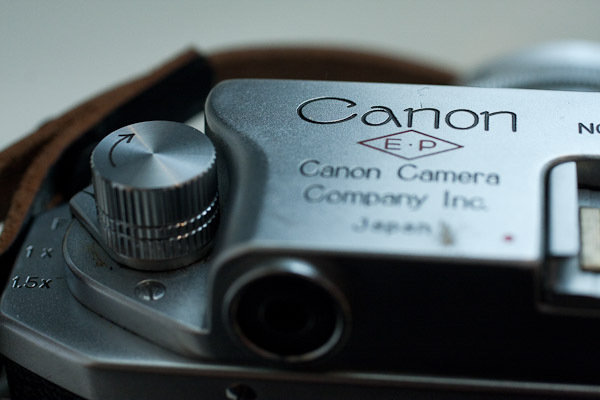 Say hello to your new* friend from Japan, the Canon IVsb. I'll never forget the moment that I first laid eyes on this particular camera. It was around ten years ago. A bit of a gamble at the time, but a potential bargain that I had found on a poorly photographed ebay listing, I didn't quite know what I would receive when I woke up one morning to find the shipping box at my doorstep. In fact, as I'd later discover, Canon produced a dizzying assortment of rangefinder cameras around this time, all unblemished by model numbers. The only way to differentiate one from the next was by the careful inspection of tiny internal labels and features, like checking if the speed dial is in thirds or halves, if the maximum speed is 1/500 or 1/1000, etc etc. I wasn't fully confident about exactly what camera I had until a week or two later, after carefully combing through a swath of online resources. But eventually I figured out that I held in my hands a IVsb rangefinder complete with unlabeled 50mm Canon Serenar f1.8 lens. I couldn't have been happier. 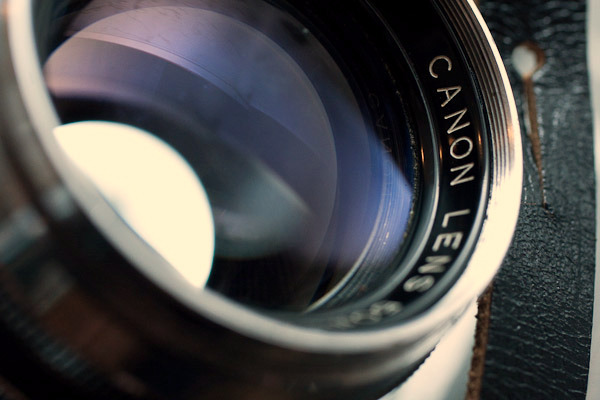 50mm f/1.8 Canon Serenar lens circa mid 1950s. Picking up this exquisite piece of Leica-forgery, this literal piece of the history that helped make Canon the juggernaut that it is today, was a moment that helped change my impression of antique cameras forever. This was like no camera I'd held before in my life, film or digital. Gone was the cheap plastic that defined the 70s, 80s and 90s cameras I grew up surrounded by. In it's place was a solid piece of brass, cold and rigid, a well defined weight that seemed to yell out to me that "this is a REAL camera." It was love at the first cold, metallic touch. rangefinders of the 30s, 40s and 50s. 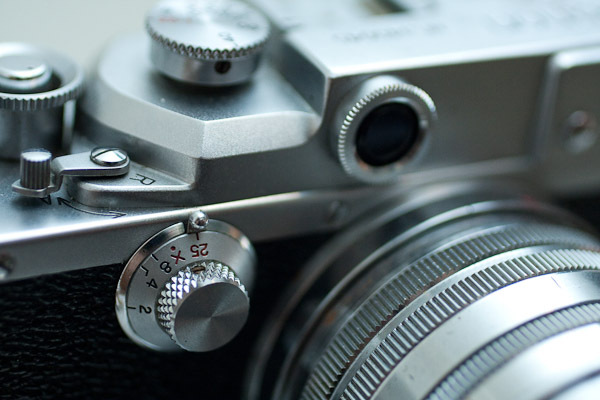 The story goes that Canon got their start when one of the founders, having saved up an eye-watering sum of cash, used it to buy a Leica rangefinder camera. However rather than using his new purchase for photography, he apparently disassembled it, seeking answers as to how it was engineered. Was the thing build with rare metals, advanced, futuristic technology? Could there even be a hint of magic inside? Of course not. 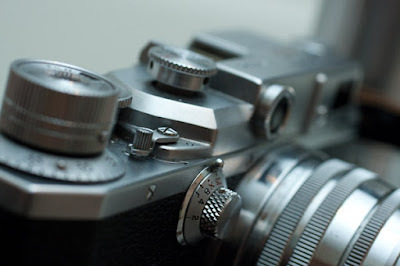 And on discovering that his Leica was made of nothing more than ordinary, simple brass parts, the story then goes to say that he had his inspiration, realizing that engineers in his home country of Japan could also produce a camera of this quality, but at a much lower price. I have no idea if this is all true or not, but if it is, I think it's a great story. Even if it's not 100% true, I still like the story. For the weeks and months after I received my new antique, I began to learn about what it had to offer- solid construction, smooth manual focus, satisfyingly firm click of the aperture ring, a relatively silent shutter that was essentially functional and accurate. And all the other quirks, the good and the bad. Rangefinder shooters say this all the time, but one of the things I love about the IVsb is it's size. The camera body is not much thicker than a canister's width of 35mm film, just as it should be. It stands with a low profile, and even with a 50mm lens jutting out from the front center, there's nothing about the size that prevents it from being easily packed or carried just about anywhere. An almost identical copy of the Leica IIIc, all the dials and controls are as subdued and carefully laid out, just as they should be. No film advance lever here. This baby's nothing but knob. Shutter speed, shutter release, film advance + frame counter + film speed dial. Whilst almost a perfect copy of a Leica(to the point that some parts are compatible), Canon took the opportunity to make several small but highly useful improvements over Leica's original design. The first improvement was with the internal film take-up spool. When fully assembled, the take-up spool is a bit recessed in the Leica III, and can be a bit hard to pull out when loading film. Canon added a spring-driven extension, one that could be locked in place for minimal profile, and fully extended with just a quick twist at the top with one finger for easy removal. Another feature was the addition of a 3-distance frame window on the Canon, with distances listed as F, 1x and 1.5x. In addition to improving the framing with zoom lenses, this could also be used as a simple focusing aid on wider lenses. Canon made one other change, perhaps the most important, and it makes precision focusing considerably faster than on a Leica III. Canon merged the viewfinder window and the framing window. No more split eyepieces, no need to go back and forth from focusing to framing. 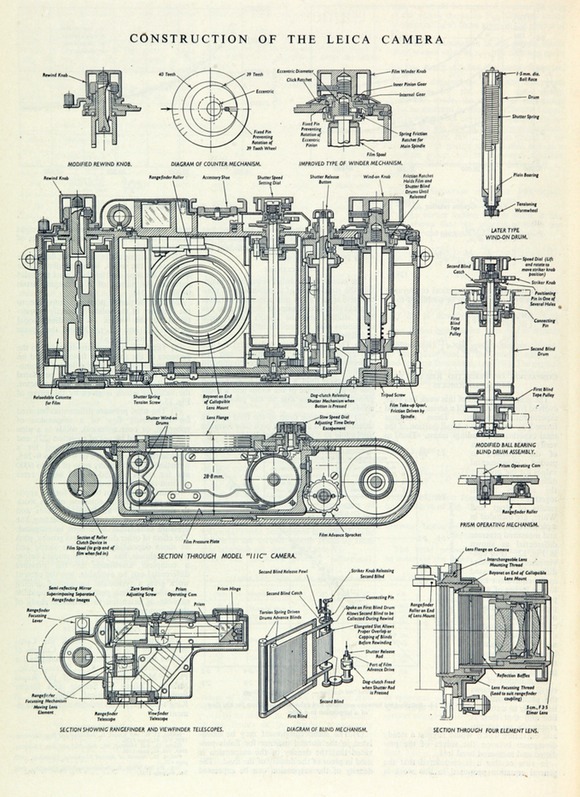 It seems like such an obvious engineering decision today, but I suppose that when Leica was designing everything back in the 1920s and 1930s, they were figuring it out, paving the way for everyone who would come later. 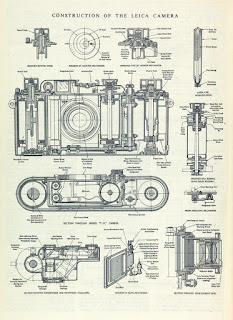 And of course in later cameras, Leica went with this approach as well. But Canon did it first. Thank you for that, Canon. Job well done. containing an integrated focusing mechanism. As much as I love using the IVsb, the camera's design is not without several serious oversights which can get in the way at times. The first of these such flaws that I encountered had to do with film loading. While Canon did make a cool little improvement in the take-up spool, they neglected to improve any of the other film loading characteristics. When you load in a new roll of film, the leading edge needs to be cut out a bit longer, up to an extra inch or two, if you want to be able to load film so that it will neither get caught going in, or slip off the take off spool. As I was still figuring out how to handle this, I recall that I once thought I had gone 15 shots into a roll of film before I realized that my film had never once advanced an inch. You can pre-cut your film to compensate for this, you can try to make extra sure that your film is advancing when you load it, but it really is annoying to have to deal with this. And miss a few shots, maybe even a whole roll of film to this problem, and you'll never again feel safe about having properly loaded the damn thing. Another issue can be with slow shutter speeds. 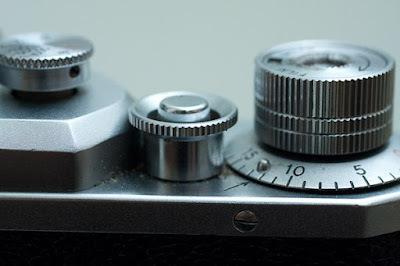 For shutter speeds of 1/25th of a second and below, the speed adjustor is a small dial on the front of the camera. Not such a big deal overall, BUT I found out the hard way that it's not difficult to forget to turn the top speed dial into the appropriate position that activates the front, slow-shutter speed dial. If everything could be integrated at the top, this wouldn't be an issue. But it's not, so beware if you ever use this camera or one of its many variants. Slow shutter speeds are adjusted with the small dial on the front. For me, the most concerning design flaw has to do with the viewfinder. I can forgive that it's tiny. I can even accept that it's so small and dim that focusing it in low light becomes nearly impossible. What can become seriously problematic is trying to use the viewfinder when wearing glasses. 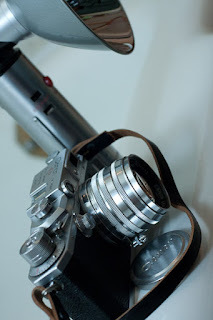 The problem is that the back of the optical viewport is made of metal. It's finely made texture is beautifully made, but if you press it against the plastic lenses in most glasses today, you're almost certainly going to end up with a series of scratches in the lenses of your glasses. Trying to avoid this by holding the camera a bit farther off from your glasses is basically impossible since the viewport is far too small to see through at any distance. Through trial and error, I learned the hard way to never use this camera unless wearing contact lenses. Clearly this problem will only affect those who don't wear glasses, but for those of us who do, this is an important point to consider before doing any photo work. It's been a number of years since I first laid fingers on the Canon IVsb's diminutive body, but I still enjoy picking it up. Even just looking at it makes me happy. And the body does its job in that if I control it as I should be, it will give me sharp, well rendered photos. I don't use it as much as I'd like to, however. While some of this can be chalked up to the fact that film is really niche at this point, only for people who feel a deep passion for the medium, there is the simple fact that even when compared to other antique rangefinders but with decades-newer designs like the Leica M3, it can be challenging to get the photos that you really want out of the Canon IVsb. Each roll of film is kind of like a lottery. Sometimes you win, and sometimes you lose everything. I'm not usually inclined to gambling, and that probably has something to do with the infrequency that I shoot with this camera anymore. But that's just me. 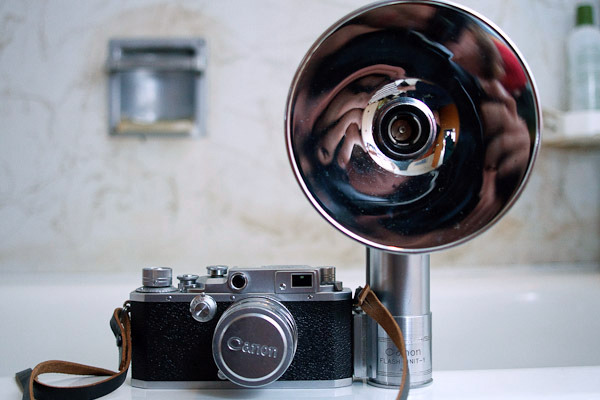 Others who love great pieces of camera history, people who can also take the high possibility of some unexpected rolls of film, will adore this camera. Honestly if I had to choose only one camera to use for the rest of my life, film or digital, I'd probably choose this one. It's weathered the last sixty years phenomenally. I've no doubt it can easily stand up to another sixty. [November 12, 2016] I intended to post sample shots, but I discovered that the IVsb I had access to has a rangefinder that's out of horizontal alignment. Once this has been adjusted, I'll try again.